Richmond Zine Fest is Upon Us!!! Richmond Zine Fest is fast approaching!!! Friday October 4th there is a zine related event at Studio 2 3 that the Richmond Zine Fest Organizers will be attending!! 1617 W. Main Street it is an exhibition of summer themed zines! Saturday October 5th is zine fest. You can still sign up to table online at http://www.richmondzinefest.org – Its at the GCCR from 11-6pm details on the website! Also the RZF Safer Spaces policy is now on the website too! After the Zine Fest we will be having hangouts at Lamplighter from 6-8pm! Tags: anarchist, dirty girls, fund raisers, radical, richmond zine fest, RVA, Wingnut, zine, zine documentaries, zine fest, zine movies, zined! A documentary by Marc Moscato from 1997. The film explains what zines are and goes into the motivations behind self-publishing. It features interviews of legendary 90s zinesters and some wild editing! The film is becoming increasingly rare, but we have secured our hands on an original VHS copy of it! Dirty Girls is another short documentary shot independently in 1996 about a group of 13-year-old riot grrrls in Los Angeles who were socially ostracized at their school by their peers and upperclassmen. ABOUT US: The Richmond Zine Fest is an annual event at which local and national (and perhaps even international if we’re so lucky) zine-makers can gather to sell and trade their zines and network with other people in the zine community. The zine fest is not just for zine creators and distros. It’s an open event for all ages with tablers selling zines as well as other DIY items, informative and fun workshops throughout the afternoon, and good times, food and conversation in general. This event happens every Fall–typically during the month of October. The Richmond Zine Fest has been going strong in Richmond, VA, since 2007. Richmond Zine Fest Fliers- Print and Share! Please feel free to print and share these Richmond Zine Fest Fliers! We are super excited to already have a confirmed date and venue, and to have our table and workshop registration open. The Richmond Zine Fest Organizers will be meeting on Tuesday March 5th at 5pm at the Crenshaw House (GSEX building) at VCU on Franklin St near Harrison. If you are interested in helping organize zine events and fundraisers leading up to the 2013 Richmond Zine Fest please come! Richmond Zine Fest – Planning Meeting and 2013 Date! The next Richmond Zine Fest organizing meeting will be on Thursday Feb. 21st at 5:30pm at the GSEX building (Crenshaw house at VCU) on Franklin, near the intersection of Franklin and Harrison. If you are interested in helping to organize, fundraise, and advertise, please come out! 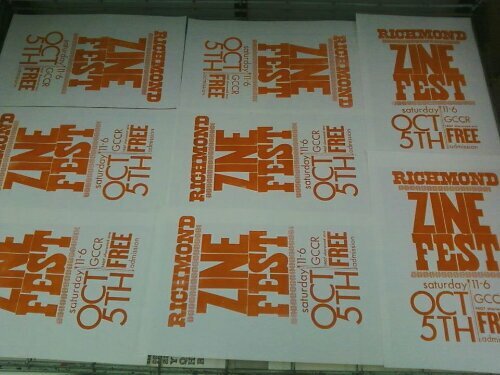 The 2013 Richmond Zine Fest will be on Saturday October 5th from 11am to 5pm at the Gay Community Center of Richmond. Sign up for tablers and workshop facilitators to be coming soon. Please spread the word to out of town tablers, this is gonna be the best Richmond Zine Fest yet! Workshops at the 2012 Richmond Zine Fest! Here is the schedule of workshops for the 2012 Richmond Zine Fest!!!! The Richmond Zine Fest is Saturday October 6th from 11am to 6pm at the Gay Community Center of Richmond (1407 Sherwood Avenue). The Zine Fest and all workshops are free and open to the public. Over 40 people/groups will be tabling, selling their zines. And we have 6 workshops scheduled for this year! 12:00pm- Radical Mental Health – Mind(ful) Liberation Project – Description: This workshop will introduce folks to the idea of mental health from a radical, community-supported model, that encourages both proscriptive and prescriptive action to maintain mental wellness on individual and community levels. This workshop will be of use to those feeling burnt out, isolated, depressed, overwhelmed, in life, in work, in activism, as well as those just curious on radical alternatives. Background info: Mind(ful) Liberation Project has brought a much-needed radical activist approach to mental well-being in RVA. We work tirelessly in destigmatizing and speaking out about differing mental health concerns, termed “mental illnesses” or “disorders” by the Psychiatric Industrial Complex. We were founded in 2010 with the idea that we can empower ourselves and our communities to candidly and openly talk about mental health and alternatives to mainstream mental health services. We work to create options and choices that are available to all. Our principles include working beyond the medical model of mental health, educating ourselves about alternatives, balancing wellness and action, non judgment and respect for diversity, non-hierarchy and anti-oppression, nonviolence, and transparency. 1:00pm – Journaling As Art – Anya Lynn Garten – I will define artistic journaling and then share examples. Students will be asked to write and each student’s work will be workshopped in a group setting. 2:00pm – Introduction to Liberate RVA – Kal Molinet – Liberate RVA is a freedom movement against the occupation of violence in our community. If you’re curious about how to achieve real freedom in our lifetime, please join us in an active discussion and introduction in understanding what this freedom movement is all about! 3:00pm -Creative Writing: Short Fiction – Robert Mitchell – What makes a good short story, and how do you tell it in limited space? Sit down with your fellow ‘Zinesters and talk about the art of writing short fiction. Get and share tips and tricks, and learn to avoid the traps and pitfalls. 4:00pm – Teen Worker’s Rights – The Richmond Industrial Workers of the World – The Richmond branch of the Industrial Workers of the World seeks to empower young workers by educating them about their rights as employees in Virginia. These include many special rights, restrictions and exceptions regarding pay, hours, safety and benefits. We want to share our idea of solidarity unionism and show that all workers, no matter what their age, have the right to stand up and defend themselves and their fellow workers. Participants will leave with a better understanding of their rights and detailed pamphlet and work journal. 5:00pm -Practicing Good Consent- Robin Leach – A brief workshop designed to create a space through which we can discuss how to deepen our practice of consent in relationships. We will be discussing how to assess our own boundaries and desires, and how to maintain consent and accountability. Whether you are curious about learning how to practice consent or want a place to check in with your own boundaries and methods of communication, this is a safe space to do so. There will be a zine reading and potluck event on Friday October 5th for the Richmond Zine Fest. It’s a pizza potluck! We will provide the dough, you bring a sauce or topping! Vegan/vegetarian/dairy/meat all acceptable for toppings and sauces. If you are interested in reading from your zine please email xveganarchistrvax@gmail.com or show up with your zine! 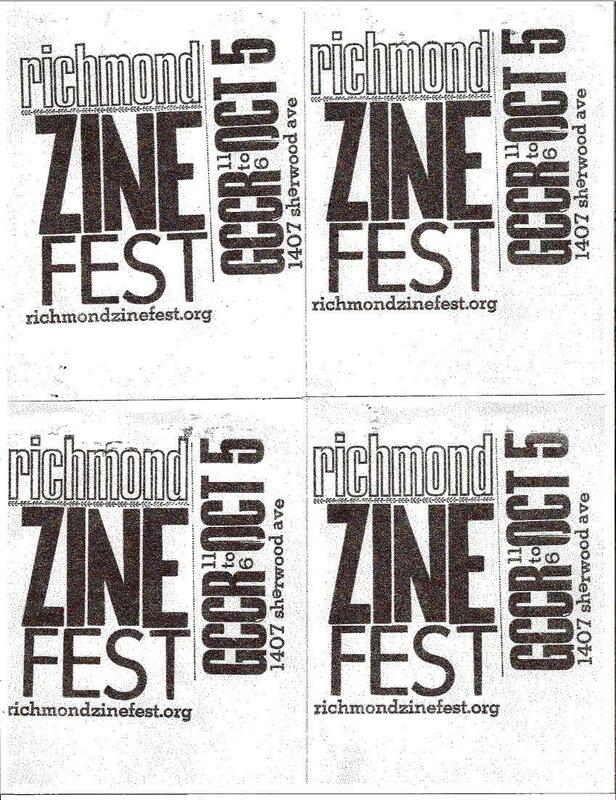 The next day Oct. 6 is the Richmond Zine Fest at 1407 Sherwood Avenue / the Gay Community Center of Richmond. From 11am to 6pm! Free to the public! Zine Reading Night on August 4th at Bainbridge Collective! Come on out at 7pm on August 4th to hang out in the back yard of the Bainbridge Collective on Southside and listen to some local zinesters and zine enthusiasts read from their zines or zines they love. Danny Rathburn will be presenting. More confirmed readers on the way. Please get in touch if you want to read for this event. 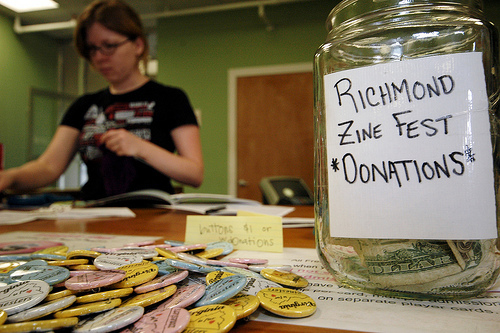 We are asking for folks to bring a few dollars to donate to the Richmond Zine Fest. The Bainbridge Collective is located at 1300 Bainbridge St.
Come on out to listen to live music and support the Richmond Zine Fest! Wed. July 11th at 9pm! The Camel has an amazing full menu and bar, so if you arrive hungry, you won’t be disappointed. The Camel is located at 1621 W. Broad St., across from Lowes. Richmond Zine Fest Fundraiser at Balliceaux May 7th! Richmond’s story telling group, Secretly Y’all is hosting an event on Monday May 7th at 7:30, with the proceeds going to support the Richmond Zine Fest! Come on out to Balliceaux to hear stories and maybe share your own. Celebrate Richmonder’s sharing their stories, whether orally or written!